If there’s one toy that can transcend cultural, age and geographical barriers, it’s Lego. The timeless toy has been enjoyed by children all over the world and from all walks of life. But it’s not just a child’s toy – Lego is a full-time hobby for plenty of adults, too. These impressive works of Lego architecture were all created by people who have a healthy affection for the colorful building blocks. Is there any better way to commemorate a special day than to build it in Lego? Here, two unforgettable moments in American history are recreated in plastic blocks for all to enjoy. 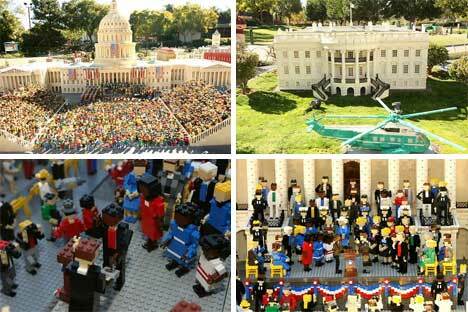 At top, President Obama’s inaugural ceremony appeared at Legoland in Carlsbad, California. The scene featured thousands of tiny Lego people, including the president and his family, George W. Bush and his family, and a number of celebrities who were on hand to celebrate the occasion. Just below that is the touching recreation of the Miracle on the Hudson, or the day that pilot Chesley “Sully” Sullenberger emergency-landed an airplane on the Hudson River. 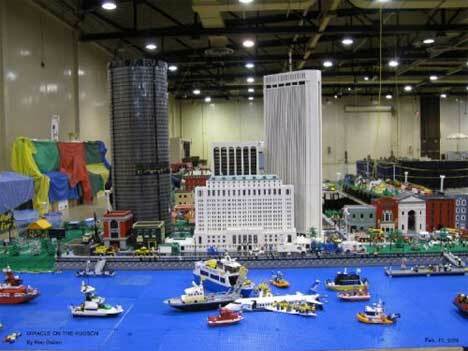 The large display was created by the Central Ohio Lego Train Club. 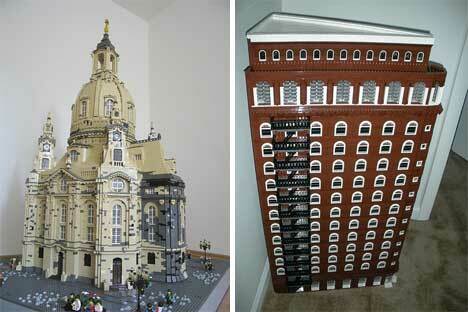 Some landmarks are so well-loved that it just makes sense to recreate miniature models of them in Lego. 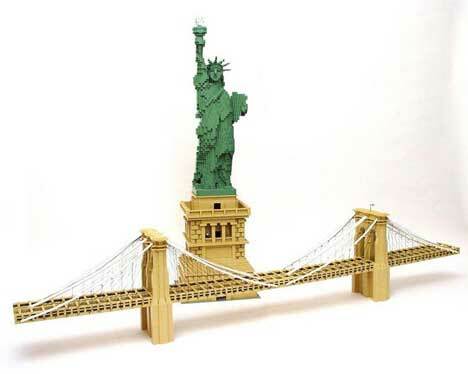 These two from master Lego artist Nathan Sawaya are immediately recognizable: the Brooklyn Bridge and the Statue of Liberty, complete with her painstakingly-reproduced pedestal. With the right pieces, a lot of patience and a fair amount of creativity, a skilled Lego builder can create just about any landmark imaginable. Here, the Hall of Supreme Harmony, Leaning Tower of Pisa, Arc de Triomphe and Roman Colosseum all come to life under the talented hands of one Lego master. With some sculptures taking weeks or even months to finish, Lego artists have to keep their eyes on the end result: sculptures that redefine the relationship between toys and art. 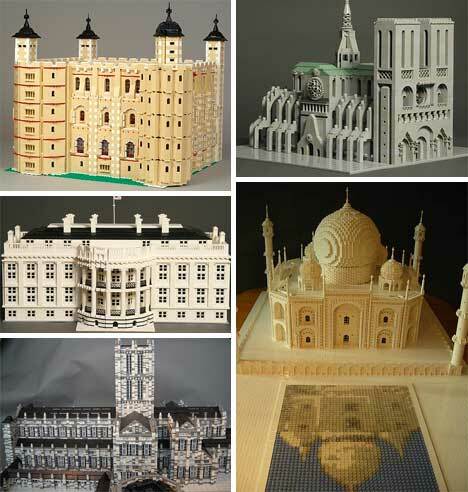 Certainly, no one could deny that these masterful sculptures are art, even though they are built with little plastic blocks. 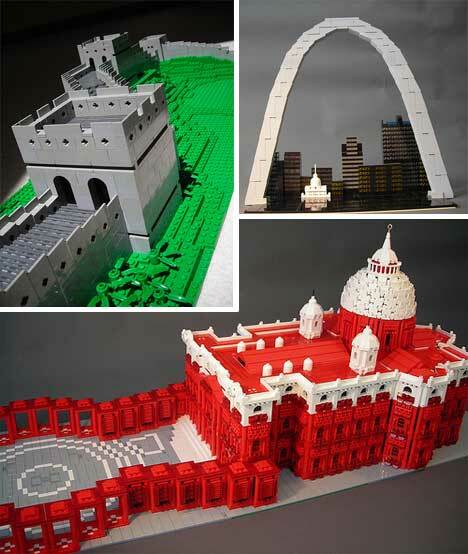 Above, the Great Wall of China, St. Louis Arch and St. Peter’s Basilica are rendered in delightful detail. All of these sculptures, as well as the two sets above, are by Cleveland school teacher Arthur Gugick. He’s been building with Lego since the 1960s and has become something of a legend in the world of MOC (My Own Creation – a Lego term used to denote Lego sculptures not built from kits). He had to take on a part-time job to pay for his Lego addiction, but he brings endless joy to viewers at Lego conventions and his legions of Flickr followers. 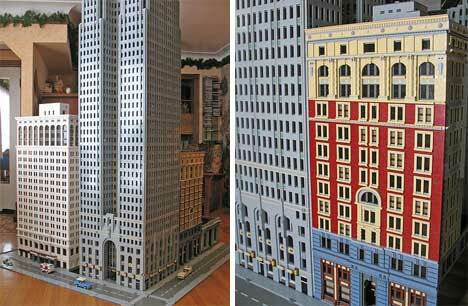 Some buildings manage to be nearly as impressive when built from Lego as they are in real life. 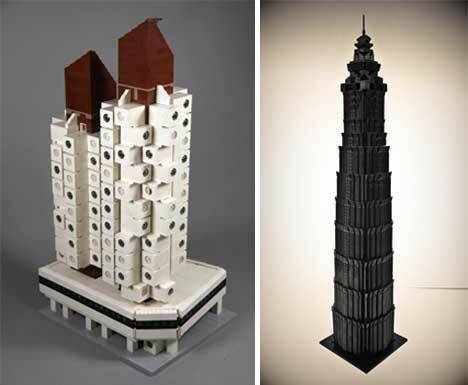 At top are the Nakagin Capsule Tower, one of the first prefab modular modern buildings, and Shanghai’s Jin Mao Tower, which was once the tallest building in the People’s Republic of China. Just below that are two of Croatia’s most recognizable buildings: the Art Pavilion and Mestrovic Pavilion, both in Zagreb. 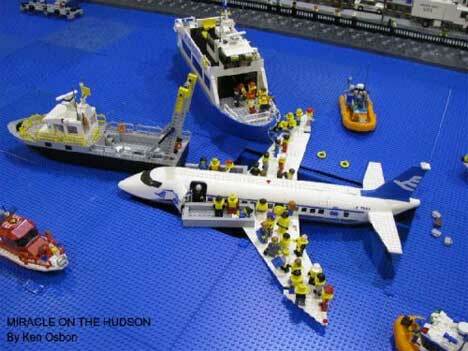 People are often amazed at just how versatile and expressive Lego can be. Over the 70-some years that the bricks have been around, they’ve gone through few changes, but the company has made more and more variations in terms of colors, special pieces and licensed sets. 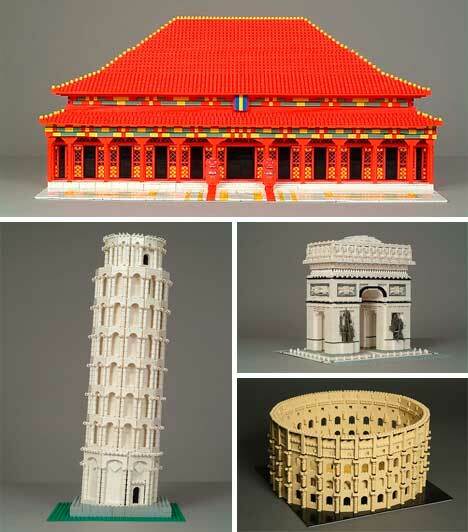 These variations have allowed Lego sculptors to create some truly mind-blowing pieces of art. Of course, some of the most impressive pieces are those that depict real-life architecture. 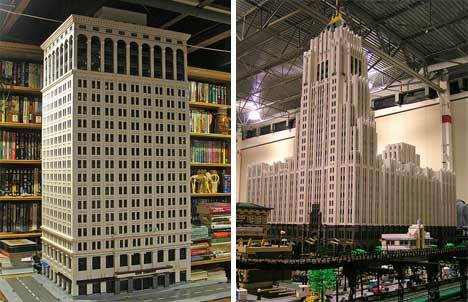 This set of Detroit buildings shows off one Lego builder’s love of the city’s unique and memorable architecture. 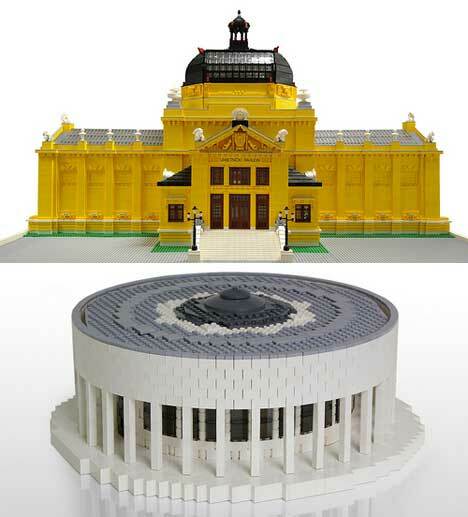 Of course, it’s no wonder that Lego is so often chosen to recreate the world’s greatest architecture. The blocks are, after all, the perfect shape for building and snap together so that creations are (mostly) stable. But building with Lego isn’t child’s play; to build a large structure takes a real understanding of building principles. Building without taking into account the weight and skew of the bricks will result in collapsed structures. Above, two magnificent recreations of some very recognizable buildings: the Church of Our Lady, Dresden and New York’s Flatiron Building. 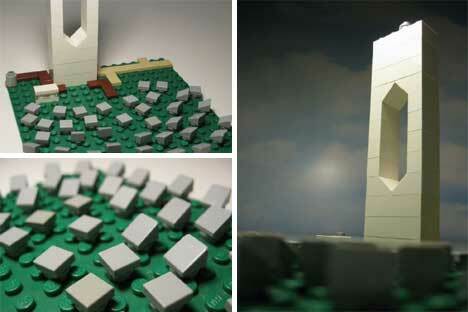 Even the somewhat lesser-known structures of the world are honored with Lego likenesses. Here, Spain’s PS10 solar power tower is remade in whimsical style with Lego, complete with tiny “mirrors” arranged around the tower. 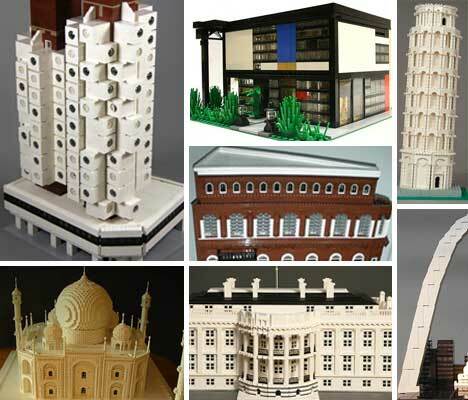 Maybe if money and fame weren’t enough for them, famous architects could take Lego tributes like these as their confirmation that they’ve finally made it. 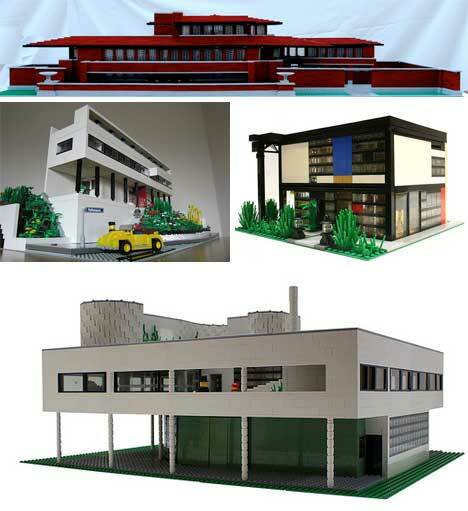 The Robie House by Frank Lloyd Wright, a Le Corbusier house, the fabulous Eames House, and the Villa Savoye (also by Le Corbusier) have all been lovingly recreated from everyone’s favorite building block. One can be reasonably sure that when your works start appearing at Lego conventions, you’ve made quite a name for yourself in architecture.